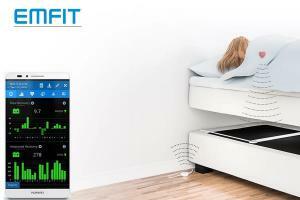 Whether you are an athlete looking to work on a recovery or just want to know if you are getting enough sleep, the Emfit QS will certainly prove to come in handy. Emfit QS can be best described as a non-wearable, full night sleep tracker equipped with advanced features to record your sleep metrics and analyze the data to help you come up with appropriate measures to improve your sleep. The unique thing about this device is that it offers full night heart rate variability (HRV) data, which allows you to know if you are overtraining as a sports person to an extent that it's affecting your sleep. To help you learn about this device and all the bells and whistles it comes with, we are going to dig deeper into it, looking at the features it offers, what makes it great, it's shortcomings, and of course, its price range to help you make an informed decision. How the Emfit QS Works: Ballistocardiography Principle! Pricing: Is Emfit QS more expensive than its Wearable Counterparts? How Accurate is the Emfit QS? If you're looking to understand better your sleeping patterns, you have two main options: go for a wearable device in form of a wrist tracker, ring or chest strap, or a non-wearable device that has no contact whatsoever with the your body. Now enter Emfit Qs, a non-wearable sleep tracker designed by a Finland-based technology brand, Emfit. This sleep monitor has zero pieces needed to be in contact with your body in order to take sleep parameters. You'll just need to position the sensor beneath your mattress and lay on your bed as you usually do. The Emfit QS comes in a sleek design and is available in white or black color choices to match your aesthetics. It's designed with a 1.8-metre cord that allows you to position away from the main device where there are radiating Wi-Fi signals. You'll need to connect the device to a power supply and configure the settings on your computer using Wi-Fi. We won't go into any details of setup. It is quite simple to get it up and running within minutes using the instructional manual inside the box. The Emfit QS utilizes ballistocardiography technology, a highly sensitive compression sensor that captures important readings of your heart, breathing rate and movements, giving you accurate readings. To get a strong signal, you'll need to place the middle part of the sensor directly under where your heart is, beneath the mattress, which is around 20 inches down from the top of your bed. If you have a spouse, you will need to keep it close to the edge so that it doesn't pick their signal as they roll over. When you wake up, you don't have to press any buttons; the sensor already knows you are up even before you touch the ground. And, well, it does this automatically. You can access all the readings via the web, by singing into the Emfit website. Don't worry about switching the device on and off to save electricity – it uses negligible amount to energy, so you can let it remain on all the time. This allows it to have enough time to send conclusive data to Emfit server for analysis. Unlike most sleep trackers which provide data collected via an app, the Emfit does it differently. The platform provides a desktop/mobile friendly web application that can be accessed from any browser. Emfit QS presents a neat dashboard with comprehensive information collected by the Emfit Qs. You can click on each of the provided metrics and drill down to discover even more in-depth information, and an overall sleep score based on all the data collected. Better yet, the dashboard provides an option to export the data via CSV format. If you want to share the data with your fellow athletes or coach, there's also an option for ‘team' sharing as well. But even with these features, some people feel like Emfit could have provided an app in addition to the web application, allowing them to easily access the data via their smartphones. This is perhaps the most important reading because it will let you know if indeed you are getting enough sleep or not and whether you should be working toward recovery. According to Emfit, it's derived by a mathematical equation. Simply put, the more you sleep, the higher your REM sleep is, and the more you get deep sleep. This will give you a better sleep score. This is basically a breakdown of sleep, and is done in three cycles: light, REM and Deep sleep. Light sleep is when you are transitioning from awake to deep sleep; when you find that you can no longer keep your eyes open, and your body feels more relaxed. The deep sleep phase is when you finally fall into sleep. At this stage, your muscle tone decreases to almost zero, breathing rate becomes steady, and heart rate slows. The REM sleep is now the dreaming phase. Your muscles are paralyzed at this point and you get into a world of your own. The Emfit Qs is one of the few sleep trackers in the market offering heart-rate variability (HRV) measurements. HVR is simply a measure of gaps between heart-beats, indicating that your parasympathetic response (part of autonomous nervous system that helps with recovery, sleep, digestion, and relaxation) is functioning as expected. According to research, lower HRV figures are correlated with your central nervous system when it comes to stress recovery. Autonomic Nervous System (ANS) Balance: This tells whether you are too phlegmatic (High HF value) or too excited (high LF value). According to Emfit, the figures should remain near 50-50 shade on the graph, right between 25 and 75. If they deviate beyond these values, then it could mean that you aren't recovering or are experiencing high stress or general fatigue. The Emfit Qs finds your BPM by computing your average heart rate every three minutes throughout the night, choosing the smallest value collected. This reading can show you if you are overtraining or have a lot of stress. If it bumps up over 7 beats per minute, you'll need to skip some exercise sessions or consider lighter exercise. As a healthy adult, you should have an average respiratory rate of 12 to 20 breaths per minute. If you have a medical condition such as fever, you'll typically find that the average BPM rises. When it comes to movement, the Emfit Q monitor can accurately differentiate smaller movements such as those caused by twitching of your arm or leg, and the bigger ones such as toss and turns. If you find a high figure of toss and turns, it means you had a restless night. If these high values continue consistently for long term, you might consider cutting down on your exercise or work on reducing your stress. Emfit QS comes with a price of somewhere in the range of $250. Generally, non-wearable sleep trackers tend to be in the same price range with their wearable counterparts. Most of them fall between $100 to $300, with the price mostly corresponding to the features their incorporate and capabilities. If you are looking for a fitness tracker with sleep and heart monitor, Fitbit Charge 3 is worth considering as one of your options and costs about $150. The Emfit QS is a high-end sleep tracker specially designed for athletes and sports men and women. Depending on where you buy the device, you'd expect to spend anywhere from $220 -$280. This is a little on the higher side compared to with other non-wearable sleep trackers such as Withings Sleep, which goes for around $100 or less. Is Dreem the Best Wearable that has an EEG Sensor? Sleep is an intricate process. It's not just about lying on your bed and waking up – a lot happens in between. Scientists can be able to collect valuable data by looking at several body metrics during the REM and Non-Rem sleep stages. These include muscle movement, temperature, breathing pattern, heart rate, and brain activity. Having been developed Emfit, a highly experienced company specializing in contact-free sleep sensing solutions; the Emfit QS has been applauded by many users as a reliable device that's fairly accurate when it comes to providing the needed sleep parameters. In fact, according to a study conducted by Kortelainen, the device was recommended as a cheap alternative procedure in sleep staging. There's also a research conducted by the Tampere University Hospital' Department of Clinical Physiology that shows the ballistocardiography principle, which is used by the Emfit QS, is effective in recognizing the ballistocardiogram waveforms. It's a non-invasive technique that captures key readings of your heart, without necessarily having to be in contact with the subject. Another research conducted by the Department of Clinical Neurophysiology by the same institution determined that the Emfit sensor is effective in providing information on breathing problems associated with sleep. It further noted that the sensor could also be suitable to screen periodic limb movements without having to come into contact with you. If you are looking for a way to improve on your sleep, you'll need to first learn about your sleeping patterns. The Emfit Qs is a good option if you prefer to go with the non-wearable devices. It has zero pieces connecting to your body physically. The device comes with a sensor that you place under your mattress, offering you all the necessary sleep metrics. Once safely installed, you just lie down and it will do the rest. With the advanced features and extras such as HRV(RMSSD value) tracker, the Emfit QS is offering serious competition to other non-wearable devices such as S+ By Resmed as well as its wearable counterparts. This feature allows athletes or people who engage in serious training to know if they are overdoing it and how that affecting their sleep. It can also help you know if you're experiencing too much stress to give you a sleepless night. There's another feature that makes the Emfit QS a favorite sleep tracker among many people. The device does not only provide you with a good range of metrics that you need to work on your sleep recovery, but also goes an extra step to allow you to download that data, letting you to conduct your own analysis with raw data. Better still, you can utilize the ‘Live Monitor' feature to get live data as its being collected. But even with all these features, the Emfit QS has its downsides. The Emfit QS works totally in automatic mode. You don't need to push a button to start or stop the tracking. That means if you are quietly playing your favorite game in bed before asleep, that period might be interpreted as sleep. This is a common problem for contactless sleep monitors that rely on body movements to determine awakenings. For example, Beddit 3 provides both automatic and manual modes to avoid this problem. Automatic mode is a great plus for any sleep tracker, but a manual mode would be a valuable addition for those who spend some time in bed before sleeping. The other problem is to do with the presenting of data. The app displays the metrics via a web interface and doesn't have an app option, as of now. Some people also complain that the data appears a bit complex at first, because of the wide range of information provided. But I don't think this is a disadvantage at all, since you'll start to appreciate the data it provides as you get used to the application interface. Another missing feature is the Smart Alarm. The smart alarm system allows you to set a customizable time frame so the sleep monitor wakes you up during a light sleep stage. As is the case with all other sleep trackers out there – both wearable and non-wearable – the Emfit Qs can provide you with important insights when it comes to your sleep patterns, but they can't possibly diagnose sleep disorders. However, if find out that your metrics are falling short of expectation, you can always consult a sleep specialist for the best medical opinion.